why dont you start a sales thread on here then maybe put the links to this site on other sites. I used to have a website dedicated to selling. I linked to it from my ebay sales and bushcraft UK. It never really got much traffic. Mostly people bought from ebay or bushcraft uk. Attracting traffic is the problem. Well I found a place to sell and most likely will be in business again, I'm currently getting some stock together. Thought I'd shake the rust off, 1st knapping for almost two months. Almost paleo too, did most of the work with the two hammerstones and just put a cosmetic flaking over the top with a bopper. Almost 8 inches, I was tempted to turn it into a Beaker or Danish Dagger, but decided to leave it as a biface in the end. That's really nice work, and it's often the simplest forms that appeal to me most too. That black flint sure is purdy too. In winter my living room has looked somewhat like that, I actually made a resolution to only knap outdoors this year, so far so good but wait till it gets cold. that's a lovely looking flint, is it what you collected last week? I always wanted to make a spear using foreshaft technology. You just have to imagine the leather wrapped bit is a 5ft long main shaft. Sweet overlapping flak scars there! I've got to get some of that flint, FOG ripple flakes are now possible with that damned good black stuff. Yar, that be real nice! I have to agree re foreshafts - they are an awesome piece of tech and would double as knives too. I love that instead of a hole in a mainshaft (meaning you need a pretty beefy shaft), that an antler sleeve could be used instead to cut down on weight etc. Apologies for unavoidable fnarrs too peeps. I also knap and carve in my kitchen as a matter of course, and have made spoons and atl-atls in a mate's living room too which was pretty much man-cave heaven. I'll try and dig it out when i get home after the weekend but i have a pic somewhere of a bodger's lounge, complete with chopping block in the centre with three axes embedded in it. Total hero. Anyway, once again, lovely blade and real nice hafting job. I know foreshaft technology was common in North America I wonder if anyone knows about it's use in other places? skalla wrote: Yar, that be real nice! I have to agree re foreshafts - they are an awesome piece of tech and would double as knives too. I love that instead of a hole in a mainshaft (meaning you need a pretty beefy shaft), that an antler sleeve could be used instead to cut down on weight etc. Apologies for unavoidable fnarrs too peeps. That's an interesting idea, I've not seen one with an antler but I'll have to check it out. Finally checkout this vid. 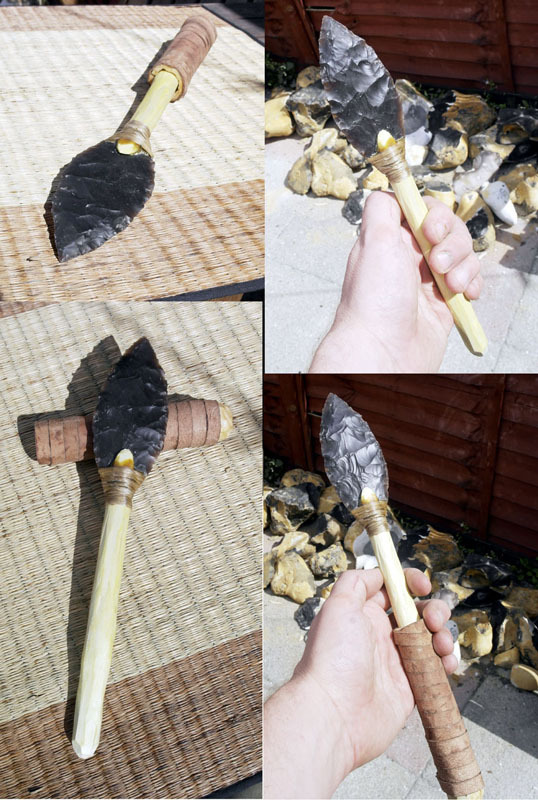 Here's what a really top notch knapper can do with his first ever attempt at flint. i cant watch the vid for some reason on the laptop i'm using atm, but re the antler sleeve, iirc that article re soaking antler had a sleeve in it. i've no idea as to the use of foreshafts in europe though, i've never looked into it or noticed it mentioned in any reading on prehistoric europe, but then what would survuve of it besides the point except in the most exceptional of circumstances? and then someone has to find it... real needle in a haystack stuff - think how many ancient euro bows have been discovered.... people discuss meare heath and holmgaard endlessly for example and only a handfull of other examples exist as far as i know. 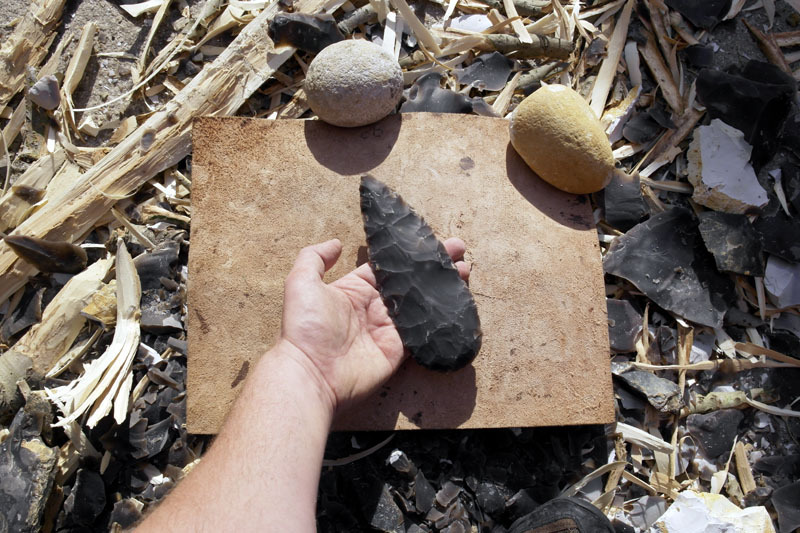 thanks for the video - just been looking at his other videos - shame we don't have such an interest in knapping in the uk, they have some nice material and good social meets. you bragging mr G - that's a nice bit of knapping, how long did it take to make? That's the shizzle! That is what black flint was made for!! Skalla, there are two Neolithic bows on display at Gessenhall museum, I'll get some photos and post them. one is a flat bow and the other is more of a long bow shape. There appears to be no corpus on British Prehistoric bows sadly. Mr HC, i look forwards to that a lot, i got two bits of Hazel drying a little prior to some bow attempts, going for a simple wide limbed self bow.... vice is broken and i reckoned if our ancestors could do it w/o a shave horse (though no doubt they invented various bracing methods) then so could i.. i'll probs just shave down the belly with it braced between my feet, it's worked for sticks and clubs so for a first bow it should do the trick as well. 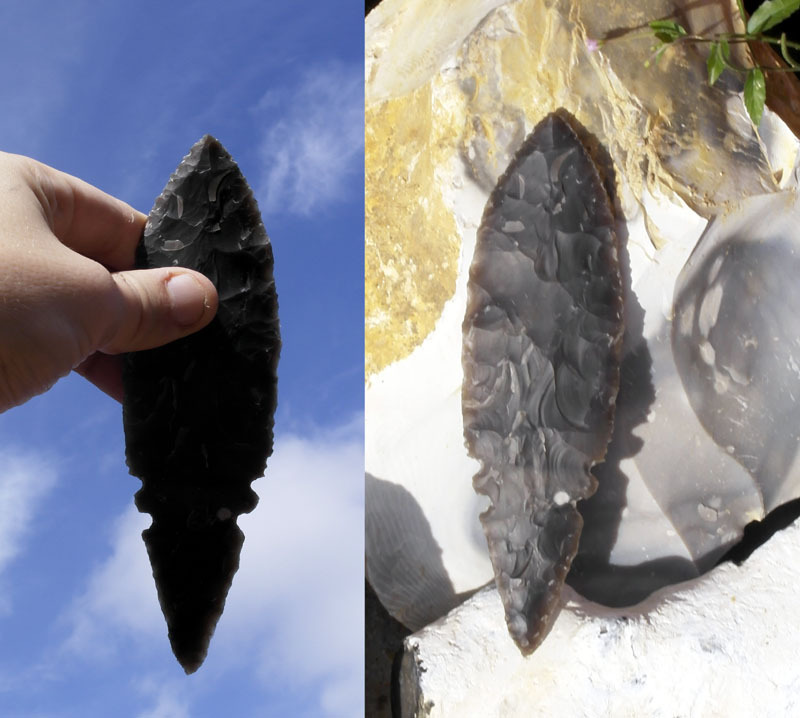 the barnacle wrote: you bragging mr G - that's a nice bit of knapping, how long did it take to make? Only a couple of hours. I was thinking of a bronze knife type wooden handle. Have you seen the resin handles the Aboriginals in Australia put on their knives?